Both of these come from the paper’s weather-page graphic by WGN-TV, a Chicago Tribune property. Both appear to have been composed by someone for whom English is a second language and then published without the benefit of copy editing. 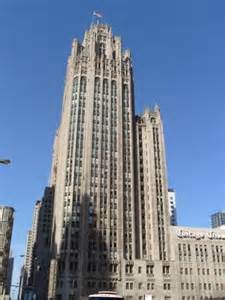 As every die-hard delivery customer knows, the Chicago Tribune has shriveled in size and deteriorated in quality. Publishers blame shrinking revenues caused by the Internet luring away advertisers. But that explanation doesn’t go deep enough. Readers and advertisers abandoned newspapers because, like dinosaurs, newspaper publishers couldn’t adapt to a new environment. They clung to an old business model that included spending as little as possible on the newsroom. This worked well enough when times were good. Now that times are bad, they’ve doubled-down on it, starving the newsroom much like conservative Republicans aim to shrivel government by refusing to fund it adequately. Newspaper publishers (not all of them, but in general) tend to loathe newsrooms, regarding them as nothing but overhead full of employees with bad attitudes who bring in no money but produce plenty of complaints from government officials and chamber-of-commerce types. When revenues began to tank 10 years ago, their first instinct was to cut newsroom budgets, lay off reporters, copy editors and photographers, outsource or centralize editorial functions, hope to get by with lower-paid, less experienced staffers and demand more work from them. In the last gasps of its death throes, the Chicago Tribune still has produced some outstanding exposes, such as its stories about the ineffectiveness and dangers of a red-light camera program shot through with corruption. Imagine what it could do if it reinvested in its core function of delivering news, redefined its mission as in-depth explanation and analysis and gave up publishing a print edition of “daily” news already outdated by digital sources the day it’s printed. It even enjoys the advantages of a huge market free from any competing papers and a large pool of unemployed, experienced ex-newsroom staffers. All it needs is a publisher with imagination and guts. This entry was posted in Chicago Tribune and tagged Chicago Tribune, journalism, newspapers, WGN-TV. Bookmark the permalink. I too am a decades-long reader of the Chicago Tribune and am appalled daily at the sloppiness of their writings – editors and columnists alike. They don’t know how to use the past-tense of words – or it has gone out of fashion and no one told me? What happened to “shone” instead of shined; bled instead of bleeded; wept instead of weeped?